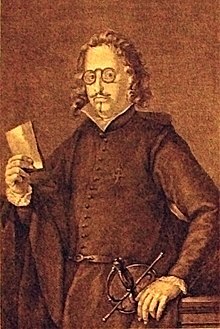 Francisco de Quevedo, after a painting by R. Ximeno. Francisco Gómez de Quevedo y Santibáñez Villegas (Madrid, 14 September 1580 – Villanueva de los Infantes, 8 September 1645) was a nobleman, politician and writer of the Spanish Golden Age. This page was last changed on 2 February 2014, at 13:27.